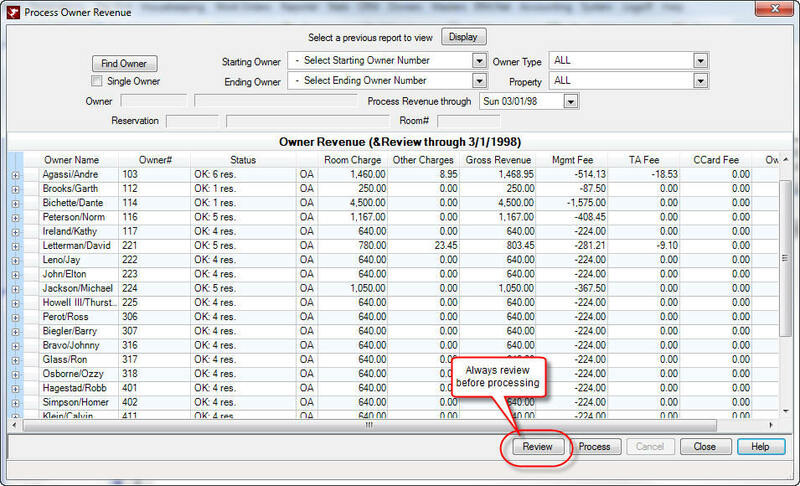 Processing revenue is a critical step in the owner statement process. It is not possible to easily undo the processing of owner revenue, so be sure to always review by clicking the Review button before processing. However, sometimes revenue is processed and needs to unprocessed due to reasons such as an incorrect date selected for processing. RDP can reverse the processing of revenue using multiple manual steps that require up to 8 hours of work. As a result, the undo owner revenue processing is NOT part of the normal support contract, but is available for a charge of $1000 for one reversal. Contact RDP Sales for details.